Shelley, I can't name her after myself! It's just weird! LOL. Termite, and Ali, will consider those. Her mama's name is Lucy so Lulu would be kind of cute but it is also my friend's dog's name. You guys should hear her snoring right now. WOAH! Didn't even complain in the bath... One of my dogs growing up was a Daisy. That might fit this one. I have a Susie now. 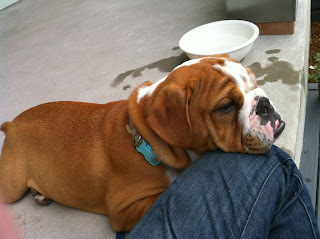 Then again there's the neighbor down the street with the huge english bulldog named Omelet. Dogs snoring are quite funny. My dog snores; my husband doesn't. 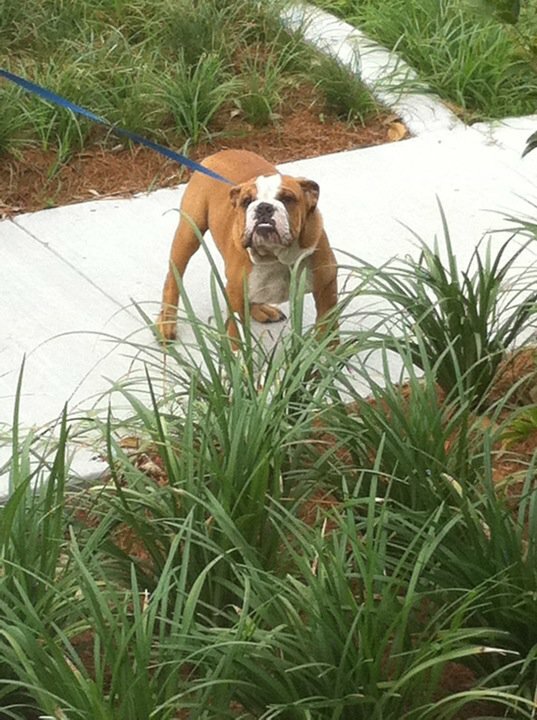 Oh my gosh, I looked at your blog because my husband and I are coming to New Orleans on Wednesday, but I saw the picture of your most beautiful English Bull Dog, We lost our Louie, very similiar in coloring and markings a year ago last May, they are the most kind, gentle, tenacious, loyal dogs! She will bring you great joy! Lili came to mind when I saw her!